There is something so magical about Christmas time in London, from going to see the Christmas lights that get switched on, visiting christmas markets, various festive activities, warming up with endless mugs of Mulled Wine and of course indulging in festive food and drinks across the Capital. Here are some of my favourites this year. There is nothing quite like the Christmas lights in London, twinkling against the night sky on the main streets giving us so much festive cheer. I love the ‘Angels’ and the elegant decorations lit up on Regent Street, just round the corner from Oxford Street. 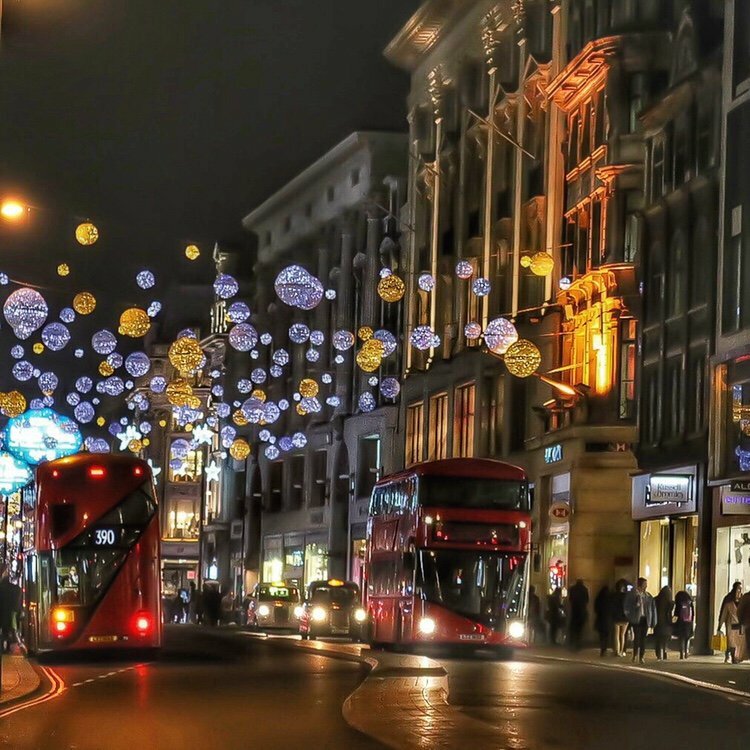 London’s busiest shopping street is lit up with baubles, and if you are lucky you may catch the occasional ‘snow fall’ too. Carnaby Street gets the award for the most vibrant Christmas lights and decor and I am loving this year’s carnival theme. The Christmas Lights on Mount Street, Mayfair, are also decadently festive and the icing on the cake is the Christmas Tree designed by Tracey Emin. See below section for more details. A visit to Covent Garden at Christmas Time is a must. As well as the many performances ongoing, the Christmas Tree is always a showstopper. While you are there walk through the ‘Apple Market’ and admire the 22ft Reindeer adorned with lights on the other side. It is pretty huge! Leadenhall Market dates back to the 14th century and I really enjoyed seeing their Christmas decorations and tree for an alternative festive feel in the heart of the city. Perhaps my favourite Christmas Tree this year is The Connaught Christmas Tree, on Mount Street/Carlos Place, designed by Tracey Emin. It is a really meaningful tree, with the angel on the top being a tribute to her mum, who she sadly lost last year. There are Christmas Trees and then there is the Claridges Christmas Tree, designed by Karl Lagerfield. Christmas Trees do not get more elegant than this! The ‘Tree of Glass’ designed by Lee Broom is a spectacular installation on the 31st Floor of The Shard, at Aqua Shard, one of my favourite places with an amazing view of London. Made of 245 individual hand-blown glass pendant lights , the design is inspired by The Shard itself. It is quite a tree! If you fancy buying one of the pendant lights, you can do so from Lee’s website and all proceeds go to the UK Solidarity Fund and London Fire Relief Fund. My favourite Ice Skating rink is at Somerset House – I just adore the atmosphere there. Whether you are a novice or a pro-skater, it is tons of fun and everyone should go ice skating at least once! After skating, or just to indulge, I highly recommend Fortnum’s Winter Lodge, also at Somerset House. The Cheese Fondue is incredible and so is the mulled wine – a winning combination! They also have Hot Chocolates, Cocktails and other food available on their menu, and it is a great place to hang out either on a date or with friends. For more pop up stalls selling food, gifts, drinks and craft, head to Southbank, which makes for a really fun day or evening out with pop ups and music, a great place to feel festive. You are spoilt with fantastic views of the London Eye when you leave too! For tons of entertainment, and to get the full festive mode on, head to Hyde Park, with skating, rides, and all sorts to keep everyone occupied and promises lots of fun. It can get really busy though so brace yourself for crowds. It is always a fun day out though and there is something for everyone. One of my favourite (and most instagrammable) places in London is Dalloway Terrace and their Winter Terrace is the BEST place to cosy up with hot chocolates served with cute gingerbread men, or Mulled Wine or cocktails, or even indulge in Cheese Fondue. The cosy chairs are amazing and if you feel cold you can even ask for the most adorable Hot Water Bottles! Whenever I want to soak in the views of London, I always find myself at Aqua Shard. I never tire of the views there! This year they have a special Festive Tipple, which I have absolutely loved – a Homemade Chilled Mulled Plum Wine. It is a lovely alternative to traditional mulled wine and served with lots of festive cheer, topped with a dehydrated orange, redcurrants and a cinnamon stick,. They also serve Festive Desserts, my favourite being the Christmas Dessert which is a cranberry poached pear served with eggnog and Christmas pudding ice cream, with 50% of the net proceeds going to the Red Cross Charity. For another cosy spot, and the perfect place to escape the mad crowds on Oxford Street during the festive month, head to The Vintage London Winter Terrace at Hyatt Regency London – The Churchill, where you can enjoy sweet and savoury Fondues, winter cocktails and be in the company of resident Sir Winston Churchill whilst cosy on super warm seats and adorable decor. Taking dining to the next level, why not eat in an Igloo. The ones at Coppa Club are fabulous although a tad bit hard to get into due to the high demand so I suggest getting there early! Think retro flasks of eggnogg, melted cheese, croque monsieurs and a fairground theme hidden away from the madness of Oxford Street. A really quirky fun place to catch up and indulge in winter favourites. There is even Negronis on tap – so much fun! There are plenty of heaters and blankets to keep you warm and it is definitely one to check out. With a glittering Christmas Tree, unbeatable views of London, and cups of Mulled Wine, what else does one need? Go for a wander afterwards through the greenery and be amazed by the architectural delights of the building as well as the 360 views of London. What are your favourite festive things to do in London during December? I would love to know in the comments section below. This post is part of December’s Travel Link-Up, hosted by Emma, Angie, Polly, and Zoe. Head over to their blogs for even more posts about the festive holiday season! These all sound so nice! Some have been added to my festive to do list! This is such an epic London tick list for Christmas, love it Binny! The Claridges tree makes me so miss London! Will have some of these on my 2018 list for when I’m home for Christmas! What a perfect list Binny! Lots of my favourites! What a great list! London at Christmas is definitely on my to do list! The Connaught always go for something a little edgy, this year it actually worked! It looks festive! It’s rare I look forward to leaving work in the dark, but its the best way to see London at Christmas!